Blog Tour: Interview with Lori M. Lee + Giveaway! I was lucky enough to interview Lori M. Lee, author of the Gates of Thread and Stone series, the first book of which was one of my favourite reads of last year. 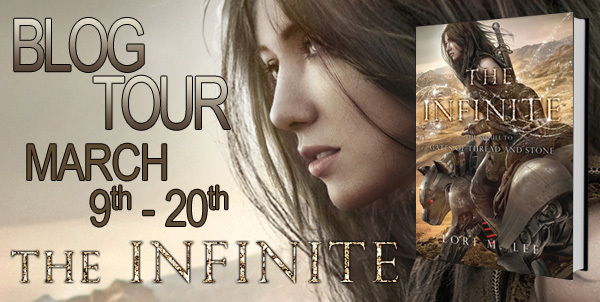 The second book The Infinite is coming out March 10th 2015, and I highly recommend it for fans of YA fantasy. I believe what I loved most about Gates of Thread and Stone was the fantastic plot; it was so well-written that I couldn’t predict what was going to happen. The ending absolutely blew me away, and this is one of the things that, for me, turns a good book into a great book. As a reader, what do you consider to be the hallmark of a truly amazing novel & how have you incorporated that into your own work? Another vital element are memorable characters. Not necessarily lovable characters or even good characters, but ones whose voices and personalities jump off the page and who you either love or love to hate. This, of course, is an entirely subjective thing. You might love a character that another reader just as easily couldn’t connect with or found off putting. Another thing that struck me was the Labyrinth and the fascinating detail you put into the initial world-building; is there real-life inspiration behind Kai’s home? Yes! I watched a documentary on the Walled City in Hong Kong. It was essentially a self-contained city running by its own rules and regulations and was once the most densely populated place in the world. Unlike Kai’s Labyrinth, however, the Walled City was also a hotbed of criminal activity, brothels, and drug dens, all of which were controlled by the Triads. It’s truly fascinating. I couldn’t find the original documentary, but this one by the WSJ is great. What do you hope readers will think, feel, or learn when reading your books? I hope readers will be intrigued. I hope they’ll connect to Kai, in whatever way is unique to them, and want to accompany her on her journey. Finally, have you read any books recently that you can recommend to fans of Gates of Thread and Stone? I recently finished Ensnared, the last book in the Splintered series by A.G. Howard (who happened to blurb Gates of Thread and Stone). I would recommend that series to anyone. It’s an Alice in Wonderland retelling/spinoff, and it’s delightfully twisted. Lori is the author of young adult fantasy novels Gates of Thread and Stone and The Infinite. She has a borderline obsessive fascination with unicorns, is fond of talking in capslock, and loves to write about magic, manipulation, and family. She lives in Wisconsin with her husband, kids, and a friendly pitbull. Lori M. Lee is giving away some The Infinite swag! Click here to enter the draw!